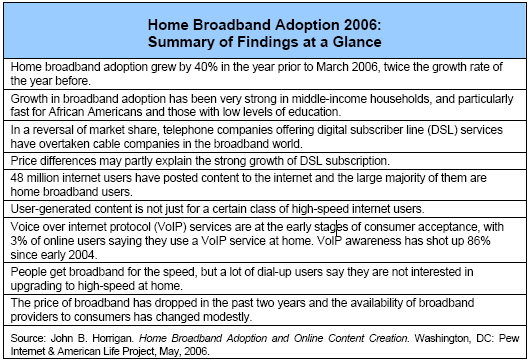 Home broadband adoption grew by 40% from March 2005 to March 2006, twice the growth rate of the year before. The number of Americans who have broadband at home has jumped from 60 million in March 2005 to 84 million in March 2006 – a leap of 40%. This is a substantial increase in the rate of broadband adoption compared with the previous year. A significant part of the increase is tied to internet newcomers who have bypassed dial-up connections and gone straight to high-speed connections. This is a striking change from the previous pattern of broadband adoption. As of March 2006, 42% of all American adults had a high-speed internet connection at home. In March 2005, 30% of all adults had high-speed internet at home. This growth in broadband adoption has been fueled in part by an increase in internet penetration in the past year, from 66% to 73%. Nearly half of these new internet users subscribe to high-speed services at home. The 40% increase in home broadband adoption from March 2005 to March 2006 is double the 20% rate of increase that occurred from March 2004 to March 2005. Growth in broadband adoption has been very strong in middle-income households, and particularly fast for African Americans and those with low levels of education. Broadband adoption grew by 68% since March 2005 among people living in households with incomes between $40,000 and $50,000 per year. Broadband adoption among African Americans increased by 121% between 2005 and 2006. Home high-speed adoption also grew rapidly in the 2005 to 2006 timeframe among those with less than a high-school education (by 70%) and senior citizens (by 63%), although in both cases the initial adoption level was very low – 8% for seniors and 10% for less-than high school graduates. The pace of adoption growth in rural areas was also brisk (39%), though not any different from the growth rate in suburban and urban America. It is still the case that broadband penetration rates in rural areas lag those in suburban and urban areas. In a reversal of market share, telephone companies offering digital subscriber line (DSL) services have overtaken cable companies in the broadband world. As of March 2006, DSL connections constitute half (50%) of all home broadband connections and cable modems have a 41% share. When the Pew Internet Project first reported on the composition of the home broadband market based on March 2003 data, 67% of home broadband users logged on using cable modems and 28% used DSL. By March 2005, the share for cable had fallen to 50% of home broadband subscribers and DSL’s share stood at 41%. Fixed wireless as a means to go online at a high-speed at home is starting to have a presence in the market; 8% of home high-speed users, or about 6 million American adults, have wireless broadband connections. Price differences may partly explain the strong growth of DSL subscription. In December 2005, DSL users reported an average monthly bill of $32 for service, while cable modem users reported an average monthly bill of $41. The DSL/cable modem price gap was narrower in February 2004. Then DSL users reported an average monthly bill of $38, while the figure for cable modem users was $41. DSL has captured a majority of subscribers in the fast-growing middle or lower-middle income range of the market. Among broadband-using households with income between $30,000 and $50,000 annually, 55% use DSL and 35% have cable modem service. 48 million internet users have posted content to the internet and the large majority of them are home broadband users. Overall, 35% of all internet users have posted content to the internet.1 Specifically, we asked about four types of online content: having one’s own blog; having one’s own webpage; working on a blog or webpage for work or a group; or sharing self-created content such as a story, artwork, or video. An even higher percentage of home broadband users – 42% or about 31 million people – have posted content to the internet. They account for 73% of home internet users who were the source of online content. Having a fast, always-on internet connection at home is associated with users’ posting content to the internet and thereby shaping the environment of cyberspace. Although home dial-up internet users get involved in putting content online, they do not do so at the same rate as broadband users. Just 27% of dial-up users, or about 13 million adults, have placed some sort content online. Sharing a variety of creations online is among the most popular kinds of user-generated content. Overall, 36 million internet users have shared their own artwork, photos, stories, or videos on the internet. That comes to 26% of internet users. Home broadband users account for about two-thirds of this number. Home is not the only place from which people upload content. Among the 11% of online Americans with access only at work or some place other than work or home (such as a library), 21% have posted some content to the internet. That comes to 5 million people. User-generated content is not just for a certain class of high-speed internet users. When the Pew Internet and American Life Project first asked about user-generated content among early-adopter high-speed users in January 2002, a “broadband elite” of mostly male technophiles were responsible for most of this activity. Today, broadband users living in households earning under $50,000 in annual household income are slightly more likely than those in higher-income homes to say they put content online – by a 46% to 41% margin. User-generated content is driven by young home high-speed users. Fully 51% of “under 30” home broadband users have posted content to the internet compared with 36% of home high-speed users older than 30. Voice over internet protocol (VoIP) services are at the early stages of consumer acceptance, with 3% of online users saying they use a VoIP service at home. VoIP awareness has shot up 86% since early 2004. At this early stage of adoption of VoIP, about half of those with VoIP at home say they still have traditional landline service at home. VoIP is making greater inroads among “early adopter” technophiles typically at the vanguard of emerging online trends. One in ten (10%) of these early adopters have VoIP telephone service at home. People get broadband for the speed, but a lot of dial-up users say they are not interested in upgrading to high-speed at home. When asked why they got broadband, nearly three in five (57%) broadband users say they simply want a faster connection. Only 4% cite a factor pertaining to price (either falling rates or promotional offerings) as a reason they got broadband. Although speed matters for broadband users, few know exactly what connection speed they have at home; 17% said they knew their home connection speed, while 81% acknowledged ignorance. Some 22% of dial-up users who do not want to get broadband at home have a high-speed connection at work. Dial-up users who do not want to switch to broadband are older and have lower incomes than dial-up users who express a desire to switch. The price of broadband has dropped in the past two years and the availability of broadband providers to consumers has changed modestly. Home high-speed internet users told us in December that they pay $36 per month for service, down from $39 per month reported by home broadband users in February 2004. For DSL, reported monthly bills fell from $38 to $32, while cable modem users reported no change (from $41) in monthly bills between February 2004 and December 2005. Dial-up users report a monthly cost for internet service of $18 in December 2005, compared with $23 in February 2004. The cost gap between dial-up and broadband internet service stood at $18 in December 2005 versus $16 in February 2004. Most home broadband users in December 2005 (61%) said they have more than one broadband service provider where they live. That is about the same share of home broadband users (64%) who said this in February 2004. One quarter (25%) of broadband users in December 2005 said they did not have more than one home high-speed provider to choose from, compared with 19% who said this in February 2004.